This is a photograph of James G. Tomson on horseback, viewing his herd of Shorthorn cattle. Tomson who owned a ranch near Wakarusa, Kansas. He served as president of the Kansas Livestock Association. 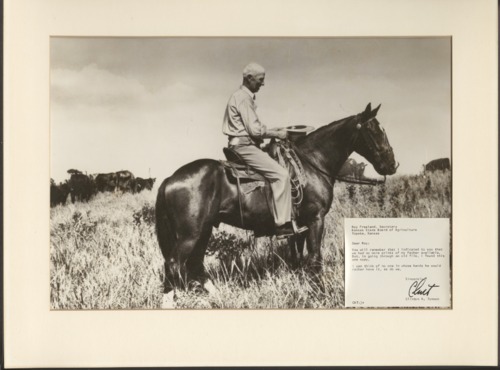 A letter attached to the photograph indicates it was sent to Roy Freeland, Secretary, Kansas State Board of Agriculture, by Tomson's son Clint.